Five Animal Frolics is an inherent exercise in China. Many schools have been formed during its development . 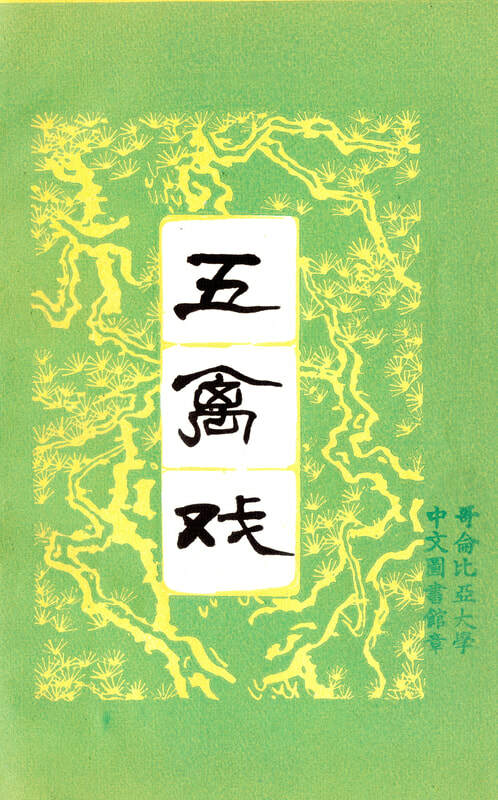 After times of selection, five forms are included in this book for you reference: Dr. Hu Yaozhen Form, featuring in internal exercise, Dr. Dai Yetao Form, in external exercise, Dr. Jiao Guorui Form, in combination of both internal and external exercises and two more forms from the ancient time. Illustrations are either from front view or side view. It is better to read the text description while referring to illustrations. Our credit goes to Dr. Jiao Guorui for his great assistance in the edit of this book. Wu Qin Xi (Five Animal Frolics) is an exercise imitating the movements of five animals for the purpose of fitness, longevity and prevention of sickness. Wu Qin (five animals) is tiger, deer, bear, monkey and crane; Xi (frolic) is playing. In this regard, while practicing, one should be as free and lively as these animals are in the nature. The history of people imitating the movements of animals for fitness can go back to the record in Zhuang Zi ∙ Ke Yi (masterpiece by Taoist Zhuang Zi) : imitating bear climbing trees and crane stretching legs is good for longevity. It showcased that people had already imitated bear and crane for exercise. In late-Han Dynasty (947BC-951BC) , Hua Tuo, a renowned Chinese physician, attaching great importance in physical exercise, developed “the imitation of bear and crane” into that of five animals and named it Five Animal Frolics. That is why it is also called Hua Tuo Five Animal Frolics. According to Hou Han Shu ∙ Fang Shu Zhuang ( a history book about East-Han Dynasty), Hua Tuo taught his student Wu Pu: “Man's body must have exercise, but it should never be done to the point of exhaustion. Exercise helps man’s digestion of food, circulation of blood and prevention of disease. It is the same with a used door pivot which never rots. For longevity, the ancient immortals, when doing Dao Yin (physical and breathing exercise), stretched their body and limbered up their joints like bears and moved around like a crane. I have created the art called Five Animals Frolics: the Tiger, the Deer, the Bear, the Monkey, and the Crane. It eliminates sickness, benefits the legs, and is also a form of physical and breathing exercise. If you feel out of sorts, just practice one of my frolics. A gentle sweat will exude, the complexion will become rosy; the body will feel light and you will want to eat.” Wu Pu followed the instructions to practice and he could hear and see well and eat like a young man in his 90s. The movement imitation of five animals is adopted not only in fitness, massage and prevention of sickness, but also in martial arts. For example, there are five boxings (the dragon, the tiger, the leopard, the snake and the crane boxings ) in Boxing Manual and twelve forms (the dragon, the tiger, the monkey and so on) in Xing Yi Boxing. Besides, Five Animal Frolics is also seen in the form names of martial arts, such as crane spreading its wings, monkey presenting the fruits, bear rubbing its back against the tree, tiger getting out of its den, ect. Many schools have been formed during the development of Five Animal Frolics. They are featured differently: some focuses on external and dynamic exercises, some on internal and static exercises, some on hardness and some on softness, and from the aspect of purpose, some is for fitness, some for massage and some for fight. If for fitness, priority is given to the exercise of Jing (精 essence), Qi (气 energy), Shen (神 spirit), then exercise of externals, internals, dynamics, statics, hardness and softness. When practicing, one should strive for the combination of all. Active, robust and graceful as they are, postures of Five Animal Frolics make the practice like a dance, which also earned it the reputation of “Five Animal Dance Martial Arts” in ancient time. Five Animal Frolics is an effective exercise for medical use and health care passed on by Chinese generations. All its schools should be discovered, investigated and organized to make it a popular exercise for the public. The five Animal Frolics is a exercise created by the famous ancient Chinese doctor Hua Tuo by imitating the natural movement of five animals, namely, tiger, deer, bear, monkey and bird. It is very effective in keeping fit and strengthening body. In its development, the Five Animal Frolics have many schools with distinctive features and styles. The one I practiced is first learned from Mr. Hu Yaozhen. Later, I learned E’mei 12 Zhuang (Trunk) Exercises, Wudang Tai Chi 13 Forms, Tiger Walk Exercises and Tian Gang Finger Meridian Exercises from Mr. Zhou Qianchuan. In my daily practice, I combine some of the features of those exercises with the Shaoling exercises I learned when I was young. In addition, I also adopted the essential principles of Tai Chi, some features of other school’s Five Animals Frolics I have seen, and some traits of the Five Animal Frolics edited by Gao Shiguo, and the Five Animal Frolics Illustrations edited by Wang Liting and other related ancient texts. In the process of sorting, I also refer to the features of modern medical sports, TCM theories and life-preserving ideas in Chinese medicine. This set of Five Animals Frolics consists of the basic exercises, basic movements and flexible practice. You can start from the basic exercises or the movements. In the basic movements, every frolic has five movements. The entire set is made up of 25 movements. You can choose from them according to your body condition. Usually, you practice one frolic every time. For the those with weak bodies, you can also only practice one or two movements of one frolic. You should choose the amount and level of the exercise by yourself. Men or women, young or old, weak or strong, everyone can practice it. Generally speaking, the weak should practice the bear and crane frolics, the old should do the bear one, the ladies should choose the crane movements while the young will prefer the crane and monkey ones. After you master the frolics, you can continue to practice if you are interested or strong enough. This set combines inner exercise with outer ones, motion with stillness, softness with toughness, spirit with forms. First, it focus on both inner exercises and outer exercises. You should train your essence(Jing), Qi and Spirit(Shen) inside while strengthening your marrows, bones and skin outside to achieve the effect of enhancing both. Second, it values the peace of spirit and the movement of body. It combines stillness and movement, from stillness to motion and from motion to stillness. It has the effects of both stillness and movement on your body. Third, it is both tough and soft while it especially cherishes softness. When you practice toughness, you must have softness in toughness. When you practice softness, you should also have toughness in softness. Therefore, you can integrate softness and toughness. Fourth, it emphasizes on both imitating the image and traits of the five animals. You should be like them both in form and in spirit to combining spirit and form. Fifth, you should concentrating on breath, inner Qi and intention. You should guard your spirit and essence inside and keep your spirit from leaking out. Your Qi is from the Dantian and returns to Dantian. Every breath should return to its root. Sixth, there are big movement and small ones. There are small movements inside big movements. You should pay attention to the slight movement of very tiny joint and muscle to make sure that every part of your body is effectively exercised. Seventh, there are both quick movement and slow ones, with focus on slow movements. If you fail to do well in slow ones, your quick movement will be empty and weak. All those traits are important to this exercise and cannot be forgotten. When you practice long enough and study and think about it, you can understand the truth beyond those words and achieve perfection. This set of Five Animal Frolics is relatively simple in form and movement. It is easy for beginner to master. Usually, you can learn the basic movements of a frolic within one hour. However, if you want to combine the inner and outer exercise and integrate motion and stillness, you should carefully practice it for a certain period of time. To master the essential features of the Five Animals Frolics, I have studied the traits and features of the five animals in zoos. I also created the Seven-Character Essence and 28 Character Rhymes for each frolic based on my understanding through practice. I hope it can help the beginners. Due to my lack of experience and understanding, there may be some inappropriate things and I hope readers can criticize and and help me to correct them. While you are practicing, you should relax your body, and most importantly, your spirits. To relax doesn’t mean loosening. Relaxation is compared to stress. The relaxation here means stress within relaxation. You should practice some poses which requires some stress to sustain. In everyday life, people always stress their spirit and body. They experience more stress than relaxation. Compared with stress, relaxation serves as a kind of rest, getting rid of the tiredness in mind and body. Therefore, we emphasize relaxation in practice. Then, you should be calm in your spirit while you are practicing. Usually, it is very hard for people to calm down. We often say that our mind is like monkey and our intention is like horse, and it is the most difficult thing to control them. Therefore, you need some practice to attain calmness in exercise. Only when you are still, you can get rid of your tiredness and store energies. Stillness is relative to motion. There is no absolute stillness, so the stillness desirable in practice is not absolute stillness. It is motion inside stillness and you should focus on stillness in your practice and be in more stillness than motion. In fact, you practice while you are awake, so absolute stillness is impossible and it is also unnecessary. In your practice, you can just limit your intention (意 yì) into a very small scope, use one intention to replace tens of thousands of intentions, and focus it in one direction instead of endless different intentions come one after another. Relaxation and stillness exist side by side. Relaxation can help us calm down, while stillness leads to further relaxation. Therefore, we should train relaxation and stillness at the same time. In addition, we should be natural in many aspects of our practice, such as pose, breath, guarding intention, etc.. In those practice, we should be natural, comfortable while getting power without forcing ourselves. It is extremely important. It is what we say that being natural is the most important thing in practice. Your intention has great impact on your body functions. There are two definitions about Qi. First, it is the air in breath; second, it is the real Qi, primordial Qi talked by TCM and the inner Qi, Dantian Qi talked by Kongfu practitioners. Therefore, to combine your intention and Qi means to synchronize your intention, breathe and your inner Qi. For example, your breath should become gentle and long by following your intention slowly. The exercise of inner Qi is to influence the movement of inner Qi with intention, therefore your inner Qi can follow your intention to gradually attain the state of guiding Qi with intention and synchronizing intention and Qi and further reaching the state of combining intention and Qi. For example, lower your Qi into Dantian, or guide the inner Qi to move in a center part or a certain path on you body, etc. This is a method to influence your body functions with intention, so you shouldn’t be intention-free or over-intended. If you are over-intended (Self-imposing), you cannot act naturally. It maybe even harmful. The right approach is what the Masters of Qi Gong said about “like with-intention and without-intention”, “don’t forget but don’t help”, “over-intention is an obsession with form”, “intention-free will lead to emptiness”, etc..
Movement refers to the movement of body (external) and that of inner Qi (internal). Stillness refers to the stillness of form (body stillness, outer stillness) and that of spirit (heart stillness and inner stillness). Everything in the universe is changing in continuous movements. So is human’s life. Therefore, movement is the base, and stillness is relative to movement. In its nature, practicing Qi Gong is to activiate and adjust human’s body function to help it move better, thus achieving the function of harmonize Yin and Yang as well as Qi and blood, dredge the meridians and cultivate the true Qi. But such a function can only be possible in stillness, so we should integrate movement and stillness. We should practice both movement and stillness equally. Integration of movement and stillness should vary according to age, gender, characteristics, health statues and level of Qi Gong practice. For example. We can practice movement after the finishing the practice of stillness, or practice Stillness one or two times and then movement one or two times every day, or practice movement in the morning and practice stillness at noon or in the evenings, or practice stillness and then movement, or put priority on stillness first and then on movement, etc.. In addition, to integrate stillness and movement, there should be movement in stillness and combine outer stillness with inner movement, there also should be stillness in movement and combine outer movement with inner stillness. Therefore, movement and stillness will be combined and the state of “movement is like non-movement and stillness is like movement”will be attained. When you are practicing, your upper part (above your navel) should be empty while your lower part (under your navel) should be solid. The practice is Qigong is mainly to train the primodial Qi (Dan Tian Qi), which is the foundation of human bodies’ movements and plays a vital part in people’s birth, aging, sickness and death. For example, those who are not good at life preserving are inclined to be “solid in upper part and empty in lower part” in their middle age and experience heavy head, light feet and unsteady footsteps. Therefore, to prevent experiencing this symptoms too early, practitioners of Qigong insist that when you are practice, you should empty your chest and full your belly, which means that you should be upper empty and lower solid and concentrate your Qi into your Dantian. You should practice your root Qi and make sure that every breath of Qi goes back to the root. You should guide your Qi down to your Dantian and pay attention to the practice of your lower primordial part. Because, only if you guide your Qi back to the root (to Dantian), your upper half can be empty. Only if your Qi root is solid, your lower primodials can be solid and your body will have the feeling of empty without anything, full of inner Qi, full of energy. Therefore, both in practice of stillness and movement, you should maintain the status of upper emptiness and lower solidness. instead of over concentrating intentions on the upper part , you should relax your intention and guide it down to your lower part. In practicing, especially the inner practice, you should be confident, patient and persistent, and practice step by step instead of rushing to achievements. You should bear in mind that, it need a process of self-training to reach the state of combining stillness with motion and intention with Qi. Besides, every exercise has its process and all requires deep foundation before proceeding to the next step. It seems very slow, but it is actually fast. If you rush to achievements, it is not good for the improvement of your exercise and it will harm you. Practice has proven that, as long as we practice gradually and step by step without rushing, we will naturally do it. In practicing the five animal frolics, you shouldn’t only imitate the movements of the five animals, you should show their traits and soul. Therefore, in practicing, you should not only resemble them in form, but also in spirit, which is more important. Only when you resemble them in spirit, your form resemblance will be natural and lively and you can show their traits and souls and combine the form and spirit. For examples, in practicing the bear exercises, you should not only imitate its heaviness in form, but also assimilate its solidness into your movement. Therefore, you can show the spirit of solidness in the soft movement and the lightness in clumsy movement. A lot of the movements in the Five Animal Frolics are in the form of curves, spirals, waves and twining. This is the roundness of movement. Round movement is whole and consistent. Some movement may not look like round, but your intention and Qi should follow the spirit of roundness. This is what we say "intention continues even when the power stops”. Liveliness refers to the agility of movement. Though, every movement has certain requirements, we should practice it lively instead of rigidly. Your movement should be slow and steady to facilitate the naturally gentle and long breath. In addition, in using power, you should guard your power. Guarding your power means hiding your power instead of showing it. You know you have power and feel comfortable with it (hidden power). Usually, you practice one or two postures of a certain frolic or only practice one frolic. In the beginning, you can practice in the order of bear, crane, deer, tiger and monkey. Firstly, the movement of bear frolic is slow and steady without much sports and it can guide the Qi down. In guarding the naval, your meridians and Qi can be harmonized and none will grow too strong. Therefore, the bear frolic is both good for curing diseases and life preserving. It can be regarded as the foundations for the five animal frolics. Secondly, the crane frolic is light and your body is fully extended in practicing, and there is not too much sport and it can adjust your Qi and meridians. Meanwhile, the dear, tiger and monkey frolics are either too much sports or too difficult, and they require some inner exercise foundations. So we put them in the later steps. After you have mastered every frolic, you can practice in the order of bear, dear, tiger, monkey and crane if you want to practice everything. It is because that if you begin from bear frolic, your meridians and Qi are steady, and you gradually increase your sport and difficulty and then end with the Crane frolics to slow down your motion, adjust your meridian and Qi. In this way, it is easier for you to withdraw your inner Qi steadily. Actually, even when you are practicing a certain frolic, you should follow this principle, for motions of each frolic is put in order under this principles. The function of Five Animal Frolics is mainly to train, in the inner perspective, the peacefulness of your spirit to cultivate your real Qi and adjust your meridians while to train, in the outer perspective, the movement of your limbs to strengthen your sinews and bones and energy. Due to the different traits of every frolic, it is different in applying them. If you want to cure disease and preserve life, you can mainly practice the get-ready form, the bear frolic (bear steps, shaking movement, pressing movement), the crane frolic (crane steps, show-the-wing) and the tiger frolic (tiger step). You can also practice other frolics according to your body condition and your progress in practice to extend your sinews and bones, flex your joints and strengthen your body and energy. You should breathe naturally. You’d better forget your breath. If you forget your breath, your breath will become natural. Therefore, beginners don’t have to be obsessed with coordinating the breath and movement. When you are familiar with the movement and your breath is gentle, your movement, breath and intention guarding will naturally coordinate. Begin steadily, practice steadily and finish steadily. This three steadiness is just like what a driver do. Start the car steadily, drive at a steady speed, and park steadily after steadily slow down. In such a way, people in the car feel comfortable without feeling any turbulence and the care itself will not be harmed. In practice, your body movement and Qi circulation should both follow this principle. Before practice, you should defecate first. In practice, you should loosen your neck buttons and your belt. You should choose a place with clean air to practice. You shouldn’t be too tired in your practice. You should save some energy and avoid excessive sweating. We all know that this exercise can energize, adjust, restore and construct your body. But, if you cannot focus in practice, you cannot get quietness amid motions or harmonize your intention and Qi, which will jeopardize your result. The Five Animal Frolics is a motion exercise. It is good for preventing diseases and strengthening your body. But, you can enjoy the result only if you practice for a certain time. Therefore, you should be confident and persistent. And practice in a certain order instead of rushing to achievement. If you want to persistent, you should make sure that you can practice for a certain time everyday. You’d better set a time to practice in your daily life, therefore you will practice even if you are very busy. You’d better practice in the morning, evening or during break from work. 此外, 还要作到自然。 这是指练功的許多方面說的, 諸如练功的姿势, 呼吸和意守等等, 都应力求自然, 舒适得力,不得过于勉强。此点极为重要,所謂练功貴乎自然,就是这个道理.